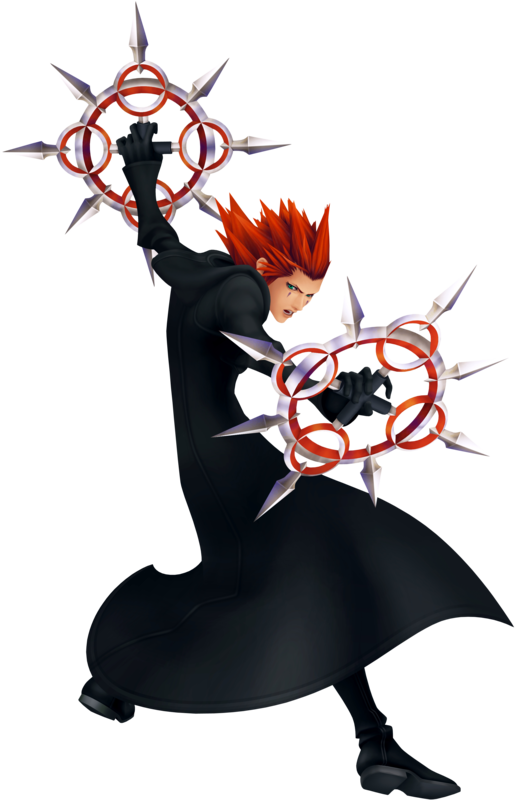 Wielding control over fire and two massive spiked chakrams, Axel is a member of the Organization that uses Castle Oblivion as its base of operations. Seemingly in cahoots with Marluxia and Larxene, Axel appears before Sora to test his strength and to further lure him into the castle in order to progress the Organization's plans. He is interested in Sora's strength, the strength of the Heart chosen by the Keyblade. Larxene accuses Axel of having a soft spot towards Sora, but whether or not that's true remains to be seen as Axel has his fair share of hidden agendas. One of them seems to be overthrowing the Organization with Larxene and Marluxia, using Sora as their pawn. The more sadistic side of his is shown when Vexen, an elder member, confronts Sora, and Axel volunteers to kill him under the pretense of going by Marluxia's orders. He shows his true colors however when he lets Naminé, Marluxia's prisoner, out of captivity and sends her to meet with Sora, before moving on to confront Marluxia himself. Following the man's own orders, Axel intends to rid the Organization of traitors, and that includes, naturally, the one who was plotting a coup d'état by using the Keyblade Master as his puppet. When Marluxia takes Naminé hostage and Axel is about to strike them both, Sora fights Axel to protect the girl, but Axel manages to make his escape. He appears soon afterward in the lower levels of the castle, and meets with Zexion, a member who has been following the movements of Riku, Sora's best friend who also arrived at Castle Oblivion. At first he convinces Zexion to try and deal with Riku, only to end up betraying him as well. He uses the Replica Vexen made of Riku to annihilate Zexion, claiming he found out too much. Number VII of Organization XIII, the Flurry of Dancing Flames is actually much more than his rank portrays. 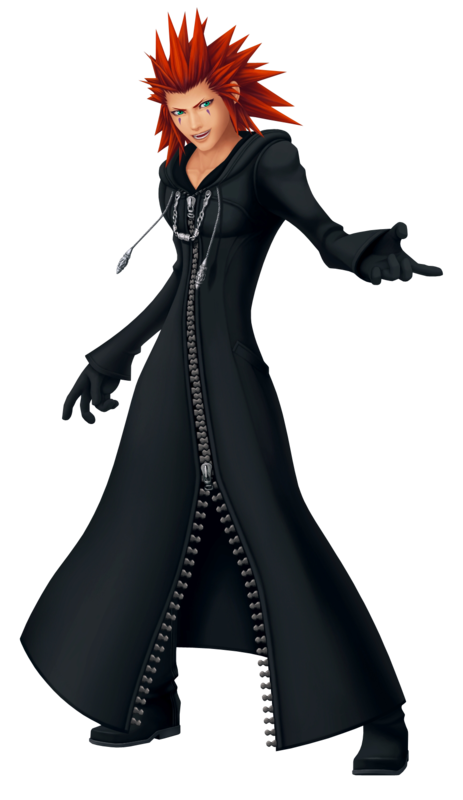 Though his role in Kingdom Hearts II is overshadowed by those of Kingdom Hearts Chain of Memories and Kingdom Hearts 358/2 Days, Axel remains the ever mysterious, taunting figure who simply wishes to get his best friend Roxas back. Since the aftermath of Kingdom Hearts 358/2 Days dictate a spell of amnesia for Roxas, Axel's mission is to do one of two things: drag Roxas back from DiZ's simulated Twilight Town where DiZ has hidden Roxas from the Organization in order to help restore Sora, or to destroy Roxas. Axel, as Roxas' best friend - though Roxas doesn't remember it or him - prefers the former, and so makes his first appearance on the 4th day at the end of Roxas' Struggle Match against Vivi. Since Axel has intruded on DiZ's simulated town, he must knock Roxas out quickly and take him back to headquarters; though he loses in the subsequent fight, it is DiZ's appearance and the resetting of Twilight Town that spells his disappearance. After threats from Xemnas and Xaldin, Axel makes his second appearance in another attempt to lure Roxas back to the Organization on the 6th day. At first Roxas shows signs of remembrance since he calls Axel his best friend but when Roxas fails to remember "the boss' name", Axel is forced to attack Roxas once again, but before he can do so he is frozen in time in the simulation, courtesy of DiZ. When Roxas runs off to the Old Mansion, Axel is freed and he admits to himself that the Roxas he knew - the Roxas that was his best friend - is long gone with his memory of his time at Organization XIII. Axel appears for the third time not long after the second encounter; he accosts Roxas in the computer room in the basement of the Old Mansion but this time he shows no affability towards Roxas. Consumed by ‘rage', he outright attacks the Keyblade Wielder and forces him into a hot, fiery battle with equally as much passion. It seems Roxas' victory douses Axel's temper and after some soft words about them being best friends, Axel vanishes on a somber note and chooses to discontinue his mission. After Roxas is absorbed by Sora, Axel is tasked with protecting Naminé by Riku. Axel's next appearance is to Kairi during which he tries to kidnap her on Destiny Islands, an act that Axel hopes will draw Sora to him and would - if Axel were to defeat Sora - bring Roxas back. Unfortunately Kairi escapes, impairing Axel's plan, before he turns up in Twilight Town where she has escaped to, and successfully kidnaps her before Saïx steals her away which sends a clear warning to Axel. However, Axel gets his own back later on after Sora finishes the 1000 Heartless battle; he exposes Xemnas' plan of getting Sora to destroy as many Heartless as possible for the completion of Kingdom Hearts, but doesn't have time to reveal anything to Sora about Kairi's whereabouts before Saïx's entrance prompts his exit. Axel last appears in the realm of Betwixt and Between - the area that connects Twilight Town to The World That Never Was - to help Sora fight off the plague of Nobodies that manifest there; he does it as an act of allegiance to Roxas. Unfortunately the Nobodies' numbers are too great and Axel is forced to use every bit of strength he has to destroy them; consequently, he was greatly weakened and put on his death bed. In the last moments of his life, he apologizes to Sora for getting Kairi involved; he discloses that he was only trying to get Roxas back since Roxas made him feel like he had a heart. But finally he has found peace with Sora since Sora makes him feel the same way, and after opening a portal for the group to escape through, he perishes. 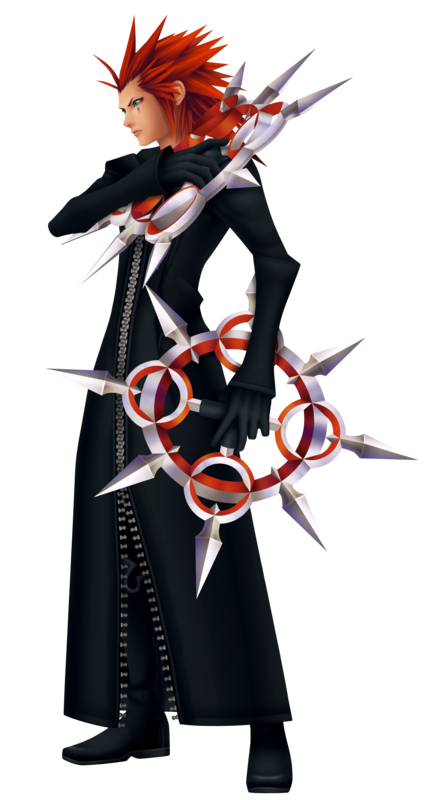 Number VIII of Organization XIII, Axel is a fire wielding Nobody who uses chakrams as his weapons. He is easy to spot thanks to his bright red hair and peculiar tear-like tattoos under his eyes. Axel meets Roxas as soon as the boy is recruited into the Organization and Axel becomes his care-taker. Two weeks later the two are already best friends, sharing sea-salt ice cream together every day on top of the Twilight Town clock tower after their missions. This routine is postponed until further notice as Axel is sent to Castle Oblivion by Xemnas's orders, which he received from Saix. He is to find the traitors amongst those sent there along with him, and Axel puts in extra effort and also eliminates Zexion and Vexen, two members which were in the way of Saix's personal goals. Upon returning, Axel is reunited with Roxas and also befriends Xion with whom Roxas met while Axel was away. The three together resume the tradition of sharing ice cream after their missions, and the bonds weaved between them are eventually declared by Axel to be unbreakable as they are the best of friends. That friendship eventually weights down on Axel's relations with Saix, who knew Axel from even before they became Nobodies - when Axel was still "Lea". The two conspired to overthrow the Organization with Axel being the one who does all the icky jobs, yet when presented with the alternative of friendship with the two younger members, Axel finds his loyalty to Saix wavering. It is especially so when Saix mistreats Roxas and more-so Xion. As a result, Saix decides to punish Axel by appointing him to be the one to drag Xion back when the girl tries to leave the Organization. This puts a strain on Axel's friendship with Roxas, who is unable to believe the lengths Axel is willing to go to to bring Xion back - even if it means hurting her. It seems Axel knows more than Roxas does, however, including the true nature of Xion's existence and her relation to Roxas, as well as the truth about Roxas himself. Believing that truth will hurt Roxas, Axel keeps it to himself even when he's about to lose the blonde's friendship he cherishes so much. Resilient in his decision, Axel keeps his silence even as the story progresses to its ending, making him face the reality that in his attempts to keep at least one of his friends safe, he ended up losing them both. Axel appears to be as agile and smooth on the battle field as he is in a conversation. Wielding his two chakrams at all times, Axel likes to dive in for several strikes before keeping his opponents at bay by throwing the two massive weapons at them, to also deal some impressive damage. As befitting his element, he tends to use a wider variety of fire-type magic spells and his Limit Break, Explosion, is rather a simplified form of that. When in his Limit Break, Axel coats his charkrams with massive balls of fire and then fires one or both to cause damage, either in close or long range. Although he appears much different than his cheerful, innocent other all those years ago, Axel still remains the same at heart, metaphorically. Eating ice cream with his best friends is a tradition that will never change, and as he gazes out towards the setting sun in the horizon with the bright colors melding in the sky overhead, he can't help but smile.